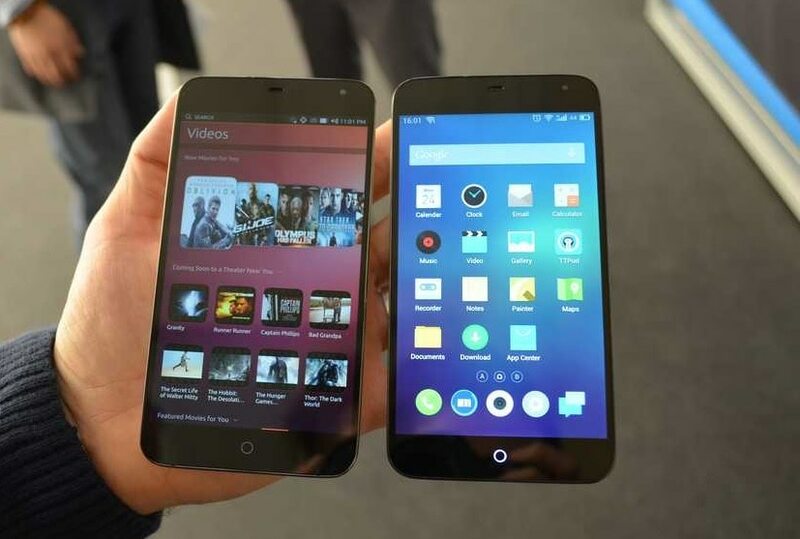 The first smartphones to run the open source Linux distro Ubuntu are expected to ship later this year, and the Chinese phone maker Meizu was on hand this week in Barcelona to show off their first UbuntuPhone. The MX3 is a $400 smartphone with 5.1" (1800 x 1080 resolution) screen, an octa-core Samsung Exynos 5410 CPU, 2GB RAM, 16GB Flash storage, and 2 cameras (2MP and 8MP). It was initially released in October 2013 running Flyme OS 3.0, Meizu's own custom version of Android, but later this year Meizu plans to release a new version that runs Ubuntu. GizChina got their hands on the MX3 earlier today, and they posted this video. It's in Spanish, unfortunately, but even if you turn off the sound the visual story will still tell you a lot. Both of the phones shown in the video are the MX3; one runs Ubuntu while the other runs Flyme. According to GizChina, the version of Ubuntu shown in the video is a developmental release which was not intended for the public. The bloggers say that they were warned that the version was very unstable, but they thought it worked smoothly and provided excellent performance. For the most part the global smartphone market is dominated by 2 operating systems: Android and iOS. How much longer do you think that will last? As we've seen this week, new challengers, including Firefox OS and Ubuntu, are starting to come out of the woodwork. Will they successfully challenge the dominant Android and iOS or simply end up also-rans like Tizen, webOS, and Maemo? Last year iOS had about 15% market share , down some 3.5% from 2012 and that’s despite launching the new iphone earlier in many markets and gaining a few major carriers during the year. Given Apple’s prices it is likely to keep loosing share , maybe at a milder rate if they launch a bigger model but they can’t stop the share decline without fundamental changes to their strategy. Windows might have alienated it’s partners because of Nokia and M$ could ruin Nokia so from just over 3% market share last year , it can go either way. Android has an emerging problem , phone makers in their race to cut costs are cutting the SoC first and we end up with lots of models using SoCs based A5/A7/A9 cores starting to dominate sales (in units). Slow perf has to drag the entire software ecosystem behind ,developers must design for the hardware…. Others could rise to significance but hard to predict who could do well. Ubuntu has the desktop mode and that’s a big asset since others aren’t focusing on scaling on bigger screens. The real opportunity for seismic changes is on new form factors and that’s mostly glasses. If Google drops the ball, others can rise. At a smaller scale, someone that would focus on tablets now could gain share when foldable screens start to show up in phones.Then i guess, stretchable screens would allow for some innovation in UI and an opportunity for OS makers. Right now it’s an Android world and it seems very hard for that to change without major hardware changes. All that for as long as the OS matters. If apps start to be OS agnostic we won’t really care anymore about OSes. Forgot to mention that subsidized hardware or even sold at cost could help some gain share and folks like Amazon or Microsoft might do it soon. Also, but this is much harder to do, very cheap data could help one sell it’s phones. In the US some might be forced to provide the data connection themselves if nobody else has reasonable internet while in developing nations the cost of the data sub is a problem for too many. iOS might have only 15% market share but doesn’t it also account for something like 70% of the profit or revenue? That’s why I listed it as being dominant. Profit is relevant to the consumer only to show how greedy someone is, how is huge profits good for anyone but Apple, from our point of view it’s a negative not a positive. As for share of revenue it is much lower. Sure iOS does have a more relevant share in a handful of nations , all developed markets and most are english speaking – US , UK , Australia , Japan. Two points here, those markets are saturated so very little growth and if you exclude those few key markets, Apple”s share drops in a huge way. I’ll address the US market further i guess but i’ll try to keep it short.The biggest problem the US market has is that carriers control the market, they decide what is allowed to be sold and mask prices. So there just is no competition. This leads to prices staying high, since the price is masked ,very expensive phones sell well and devices that offer better value don’t sell, there are very few devices on the market and lot of of phone makers are just locked out.This also kills local start-ups since they have no chance to rise by selling on the US market. You are are aware how many new local phone (and tablet ) makers are around the globe and some of them will be the next giants. This system also gives carriers a lot of leverage and “maybe” they mess with the hardware and the software too , delays software upgrades and so on. Since i wanted to keep it short, moving to the point, this also helps Apple a lot by allowing them to sell a phone with a pretty low BOM ( bill of materials ) at high prices and by not allowing competitors to gains share with lower prices. If the market was functional you would see a lot of high end devices at 400-500$ in the US and Apple would have to lower prices or lose share.Don’t know what % of iphones are sold in the US but overall Apple’s international revenue is around 60% so if the ratio is similar for the iphone, well you can see how much the current system helps them. I mentioned the BOM so here’s an example, IHS iSuppli estimate for the Galaxy S4 was 236$ ( http://www.isuppli.com/Teardowns/News/Pages/Samsung-Galaxy-S4-Carries-236-Bill-of-Materials-IHS-iSuppli-Virtual-Teardown-Reveals.aspx ) while for the iphone 5s was 199$ ( http://www.isuppli.com/Teardowns/News/Pages/Groundbreaking-iPhone5s-Carries-199-BOM-and-Manufacturing-Cost-IHS-Teardown-Reveals.aspx ). So the S4 costs some 18.5% more to make while prices around the world are in some places 40% higher for the iphone. It’s a lot like the Mac situation but a bit distorted by carriers. So on one hand you got the iphone and on the other things like the ZTE Nubia Z5s with pretty great specs and almost 1/3 of the price. This kind of share will impact the size of the software ecosystem too. All in all the trajectory is pretty clear for iOS. At least until we get big hardware changes and Apple could gain or lose a big chunk of share – if Samsung gets a 1 year head start on foldable screens for example, it would be problematic for both iphone and ipad- ofc Samung kinda lacks imagination so even if they would have the screen i doubt they’ll have a very compelling implementation but this was just an example, it cold be LG or someone else.